After this year's World Championship tournament ten players relaxed with a Berserk tournament, and Adam confirmed his position as the number one berserker! Adam: 17 pt., Kratzer: 13 pt., Xerxes: 12 pt., Hagbard: 11 pt., Vonraider and Thanir: 10 pt., Fraech: 9 pt., Tuireann and Kaagee: 3 pt., Slowlybutalsoqui: 2 pt. The Berserk Hnefatafl game was invented October 2011, at a time when we struggled with solving some shortcomings of the Fetlar game, fx. repetitions, draw forts, and above all the "Monstrosity Draw Fort" discovered by Crust and Adam. At this point Adam happened to send a photo of a very interesting set of tafl pieces from the Bergen Museum. Four attackers had top decorations, and two nail holes on top of two defenders suggested missing top decorations for a king and some other officer. So this set suggested a tafl game with three types of officer. I tried to conceive a way which such a game could have worked, and had some sleepless nights in the process. To build on historical ground as much as possible, solely rules from Fetlar and closely related historical games were considered. 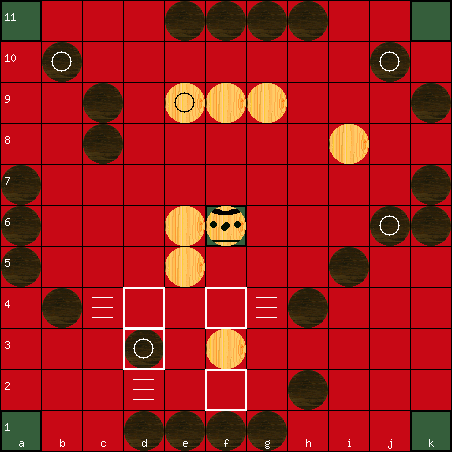 The antecedent to Hnefatafl, the Roman Ludus Latrunculorum have two jumping pieces. Now, jumping pieces would be a great way of breaking a draw fort. 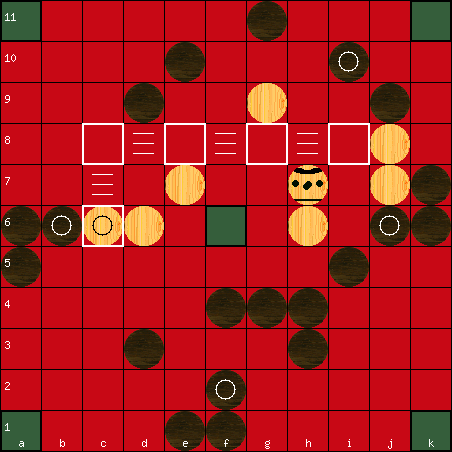 The Berserk Hnefatafl arised by using the Bergen Museum pieces and merging rules from Fetlar, Tablut, Ludus Latrunculorum, Seega and High Jump. The berserk run comes from Ludus Latrunculorum and its Somali descendants Seega and High Jump. The knight jump capture comes from High Jump. The commander jump and the king jump come from Ludus Latrunculorum. The commander king capture comes from Saami Tablut. The measured game balance is +1.26 (126 white wins per 100 black wins), which is a fine balance. Last edited by Hagbard on Fri Mar 17, 2017 6:32 pm, edited 2 times in total.